LAST-A-FOAM® rigid CFC-free polyurethane foam boards and products are cost-effective, versatile, strong and durable. They are manufactured using our unique chemical formulas to be exceptionally uniform and consistent in all physical properties. You will find a wide spectrum of formulations in multiple densities. Our rigid foam materials are available in sheets or blocks. Our high-density, flame-retardant, marine and rigid polyurethane foams are also available in a broad range of physical forms, including rigid and hard foam boards and blocks. This allows us to best align HDU foam properties with your specific needs – and help you contain material and manufacturing costs. Advanced dielectric foam material for use in radomes, antennas and other radio frequency (RF) communication systems. RF-2200 addresses the need for an RF-transparent protective layer with extended thermal processing capabilities. Hydrostatic pressure-resistant foams provide buoyancy for underwater flotation applications without liquid penetration. They are also used as core material in resin-transfer molding. Tough BMS 8-133-qualified foam cuts crisply for machining complex shapes. It also serves as impact- and fire-insulation liners for hazardous material, and as human bone-test media. This rigid foam core material satisfies fire, smoke and toxicity (FST), and heat release requirements for aerospace applications. These foam boards are ideal for composite panel cores and other structures where compound-curved surfaces or other details can be made with common thermoforming methods. Tough, grain-free machinable boards for styling, design and master models, composite/layout tool masters, and pattern making. An optimal wood alternative for outdoor signage and displays. These foam boards are ideal for precision tooling applications, or as modeling foam. Advanced microcell technology creates a grain-free, ultra smooth exterior for painted finishes, significantly reducing process time. Supports prepreg composite layout tooling for high-temperature applications up to 400F. Ideal for prototype machining, vacuum forming, pattern making and limited-run tooling. FR-4800 is a high-temperature tooling board with low CTE that can be used with high-temperature resin systems, such as vinyl esters, epoxies, and BMIs, in high-pressure autoclaves and fiber-reinforced composites. Flame-retardant foam for aircraft composite core withstands processing up to 250°F. Superb for models and design prototypes, vacuum-form dies and mold patterns, honeycomb edge closeout. 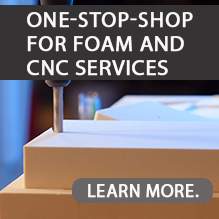 Uniform foam is easily finished or painted for low-cost core applications, hand-carved models, prototypes, CNC-machined topographical maps, composite layup tools, industrial patterns. High-density urethane cellular foam combines high compressive strength with little deflection and extraordinary thermal insulation to support heavy structural loads. Ideal for construction uses. Structural strength with moisture resistance offers boat designers a top-quality, non-decaying wood alternative that is fully compatible with fiberglass-laminating production methods.